When looking through my collection when preparing for this review I was surprised at how few recordings of Schnittke’s music I actually had, especially when he was regarded by many as the natural successor to Shostakovich. Born in the city of Engels, at that time the capital city of the autonomous Volga Republic in the Soviet Union, Alfred Schnittke could always divide opinion, loved by many, he was also vilified by those who saw his music as being too internationalist and turning away from the Soviet ideal. His music was influenced by Gustav Mahler and Alban Berg as well as by his teacher, Dmitri Shostakovich; he developed a polystylistic technique which, as his health deteriorated in later life, he abandoned for a bleaker and more austere style. 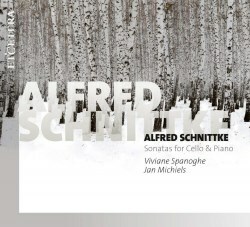 After saying that I do not have many discs of Schnittke, one that I do have is the recording of the cello concertos and sonatas on Chandos CHAN 241-39 in which Alexander Ivashkin gives a wonderful performance. A set of great integrity his performance of the First Sonata is over two minutes slower than this new recording and manages to keep the intensity of the music more than Viviane Spanoghe, who whilst she offers a very fine recording, just lacks that edge that you get from Ivashkin, especially in the two Largo sections. Where Viviane Spanoghe differs is in the three pieces for solo cello, including the Klingende Buchstaben which was a birthday present for Alexander Ivashkin, giving a beautiful performance of this difficult music. These three pieces are all new to me but in this performance, they have soon become firm favourites, especially the ‘Madrigal in memoriam Oleg Kagen’. Here Spanoghe is able to rachet up the intensity of this slow evocation, whilst keeping the listener hooked. The Sonata No. 2 was one of the composer’s final works and was published only the year before his death. This work best represents Schnittke’s bleaker and more austere later period. With its economy of style and its almost whimsical asides, the tone is quite different to the Sonata No. 1. The music is marked by heartfelt cello solos and some sparse piano writing; here there is little to choose between Spanoghe and Ivashkin, both offer quite intense performances with maybe Ivashkin’s performance slightly coming out on top in the faster jazzy sections. This is overall a very fine and worthwhile performance, one which, if it doesn’t quite meet the perfection of the Chandos recording, is not far behind. However, the inclusion of the three works for solo cello make this a most valuable release, and one which even devotees of the Ivashkin performance will enjoy. Spanoghe has written the insightful booklet notes, whilst the recorded sound is very good indeed, with the reverberation of the piano being left to fade naturally.